Many people love to indulge in a glass of wine. Some people especially enjoy it while out to eat. At Jonathan’s Ristorante a restaurant in Huntington, we offer a variety of wines you can select from to have an incredible dining experience. Red wine can range from hundreds of different types of tastes such as fruity, dry, earthy, silky, bold, and the list of flavors could go on. Wine can also be divided into light, bold, fortified, and aged as a category too. Red wine is a dryer type of wine, and due to the way the wine is made and the tannins in it. Some favorite red wines include Cabaret, Merlot, Pinot Noir, and Malbec. Sometimes this wine tends to be somewhat of a fuller bodied wine, which goes great with dishes such as red meat Also, roast or grill lamb is always a winner with this type of wine. This wine is best paired with turkey or roasted chicken. At Jonathan’s Ristorante, a restaurant in Huntington, we make a dish called Pollo al Limone that would go excellent with a glass of Merlot. Which is a lighter body of wine pairs well with seafood for example salmon or ahi tuna. Also, bright reds should be paired with a more fruity flavor such as salads or flatbreads. This is more of bold red wine and is usually best paired with bolder food flavors such as Vegetarian stews, tomato-heavy chicken dishes, and fish like salmon. Like many high-end restaurants, we carry an expansive wine list that pair well with many different foods. Italian restaurants are an excellent way to try the best wines and see which wine tastes best with different foods. At Jonathan’s Ristorante, a restaurant in Huntington, we’ve been awarded the Award of Excellence from Wine Spectator in regards to their 90 plus wine list and an artisanal menu to help bring out these exceptional wines. Jonathan’s Ristorante is happy to help with any wine or food questions. Make sure to contact us today to make a reservation. 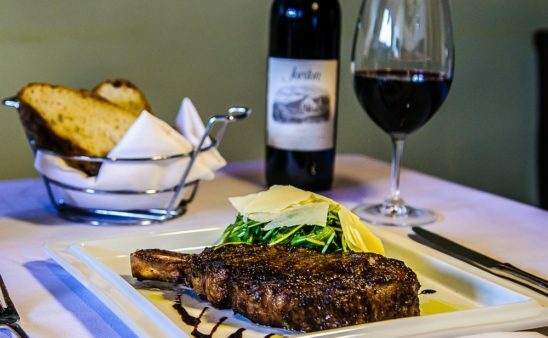 At Jonathan’s Ristorante, a restaurant in Huntington, we’ve been awarded the Award of Excellence from Wine Spectator in regards to their 90 plus wine list and an artisanal menu to help bring out these exceptional wines.